For those of our users who are into manufacturing and are utilizing the Works module of megaventory, we are excited to announce that we have introduced the feature to import Bills of Materials from an Excel template. After choosing the Bill of materials option, the user gets prompted to download an excel template. This is how the simple Excel Template looks like. Just fill in the data and you're good to go! 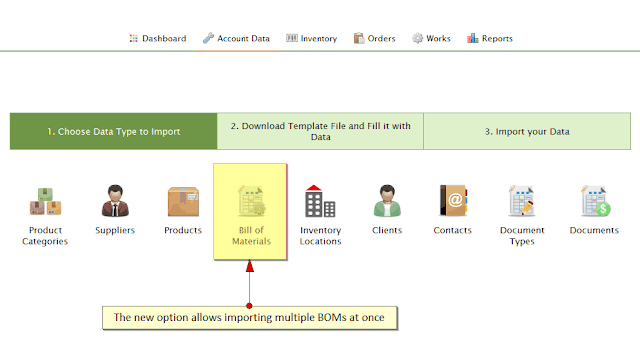 Note that the Bill of Materials import tool may be used both for inserting new Bills of Materials and for updating existing Bills of Materials. However, a BOM update is possible when certain conditions are met; for example, when no Work Order exists for the Finished Good SKU of which we intend to update its BOM. So here you go! We hope you will enjoy the new feature and please do send us your feedback and suggestions if you think there is room for improvement.